A MONUMENTAL WEEK IN CIVIL WAR HISTORY! The first week of July, 2013 commemorates the 150 anniversary of the Civil War Battle of Gettysburg, considered by many historians as the greatest battle of the war and the fateful turning point leading to the ultimate defeat and surrender of Robert E. Lee and the demise of the Confederacy. The great battle took place in three engagements on July 1, 2 and concluding with the disastrous Confederate Pickett’s Charge on July 3rd, 1863. The sun rose on July 4th over a battlefield that witnessed over 5,700 killed and more than 27,000 wounded, thousands of whom died from wounds in the ensuing weeks. More has been written regarding this great battle than any other in history, including D-Day. With the natural focus this week on the Gettysburg anniversary it is easy to overlook yet another monumental Civil War battle that historically may equal and in some sense eclipse the great Gettysburg turning point. General U.S. Grant’s victory at Vicksburg which culminated on July 3, ( the same day as Pickett’s Charge) in some sense had a greater impact on the war’s outcome than Gettysburg. Following two weeks of battle including fierce fighting at Jackson Mississippi and Champion Hill Grant turned his forces West to Vicksburg, the last remaining Confederate obstacle to opening the entire Mississippi River to Union control. Following days of brutal fighting and bombardment Grant laid siege to the city and finally on July 4th, 1863 accepted the surrender of General Pemberton’s Confederate forces and took control of what had been an impregnable citadel above the river. While there continues to be much debate over the work of Civil War historians ( See David Blight’s article That a Nation Might Live in the July 1 Book Section of New York Times ), it will come as no surprise to followers of Gordon’s Good Reads that I have turned to historical fiction and Jeff Shaara’s new Civil War book A Chain of Thunder, A Novel of the Siege of Vicksburg. Jeff Shaara is the son of Michael Shaara, author of Killer Angels, the story of the Gettysburg battle. 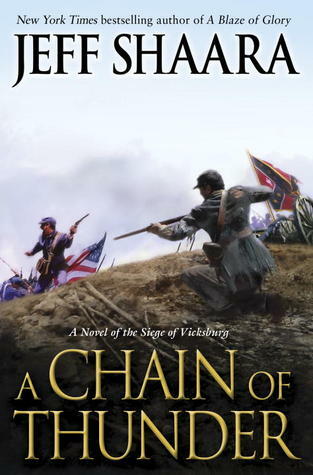 Like the writing of the father, Jeff Shaara places the reader in the boots of the front line soldiers and additionally, in the case of A Chain of Thunder the devastated lives of the Vicksburg’s citizens. Why does Vicksburg equal the historical importance of Gettysburg? The answer lies in President Lincoln’s recognition that he found in Grant following Vicksburg and his earlier victory at Ft. Donnelson, a commander who could ” win.”! There is little doubt that the victory at Vicksburg catapulted Grant into being named General In Chief of all Union Forces. In that capacity, Grant’s tenacity, with Lincoln’s unbridled support, forged the final Confederate surrender at Appomattox Courthouse in 1865. There is no doubt that the Grant Civil War legacy led to his becoming President of the United States, following the failed short-term of Vice President Andrew Johnson following Lincoln’s assassination. Whether you prefer non-fiction or historical fiction of any combination thereof, The Civil War is an epic human story that changed the future of not only the nation, but the world. Other Civil War historical novels by Jeff Shaara” Gods and Generals, The Last Full Measure, A Blaze of Glory. 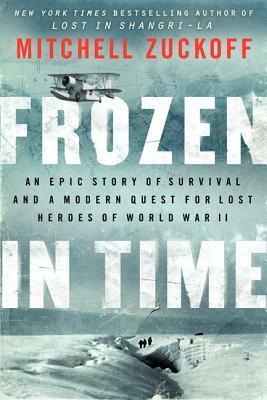 Mitchell Zuckoff’s new book Frozen in Time ranks among the best non-fiction works of survival and rescue during the Second World War. 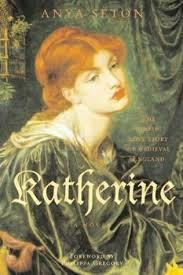 Furthermore, the book is testament to the strength of the human spirit. Frozen in Time details the crash of a B-17 Flying Fortress on the Greenland ice cap, while itself on a mission to find the crew of another downed plane. A Grumman Duck amphibious rescue plane also vanishes, adding to the complexity of what becomes an epic tragedy. Imagine, 9-men huddled in the tail section of a broken B-17 bomber, who during the first month on the ice, had no verification that anyone knew where they were! They survived 148 days of 50-degree below zero weather with 100 mile per hour winds threatening to dump their makeshift shelter into bottomless crevasse only inches away. Then came the disappointment of many failed rescue attempts and further loss of life by those who tried to save them. Zuckoff unveils a determination and fortitude of the human spirit that defies comprehension. The dimension of this gripping survival story is enhanced with the telling of the parallel expedition that took place in 2012, to find the wreckage of the U.S. Coast Guard Grumman Duck rescue plane and to return home the remains of the heroic crew. Lost in Shangri-La, by Mitchell Zuckoff, A True Story of Survival and the Most Incredible Rescue Mission of World War II. 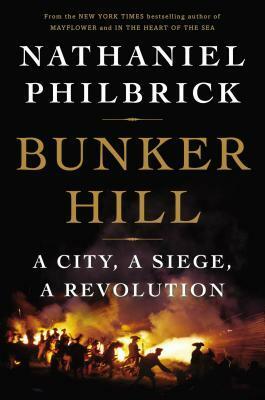 Nathaniel Philbrick’s new non-fiction work BUNKER HILL, A CITY, A SIEGE, A REVOLUTION is a rewarding history of the early stages of the American Revolution including the battles of Lexington and Concord, Breeds Hill/Bunker Hill and the siege and eventual evacuation of Boston by the British. 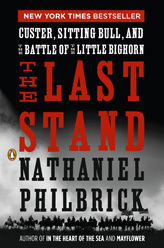 Philbrick, as was his style in his previous books Mayflower and The Last Stand, Custer, Sitting Bull and the Battle of Little Big Horn ( see review at gordonsgoodreads.com ) , is focused. 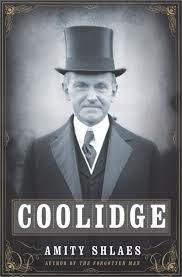 His historical research is precise and the development of the characters of the historical figures adds new dimension to this period of American History. 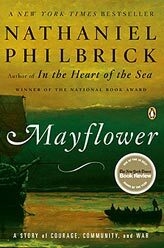 Set in 1775 and 1776, Philbrick explores the passions and the conflicts between Patriots , Loyalists and the multitude of views of those suspended in the middle. Many Patriots remained loyal to King George but simultaneously reviled against the British Parliament, clearly defining the difference between a call for “Liberty” and the pursuit of “Independence.” In the ensuing American Revolutionary War, liberty and independence became synonymous. Readers will meet a key revolutionary who stands unique among the better-known Sam Adams , John Adams, John Hancock and Paul Revere. Thirty three-year-old physician Joseph Warren cobbled together a group of independent thinking community leaders and often unmanageable farmers turned militiamen into what would become the Continental Army. Warren was a self-styled political and military leader. If it were not for Warren’s death at the Battle of Bunker Hill, Philbrick speculates that relatively obscure George Washington may never have been called upon to assume leadership of the Patriot forces, which of course ultimately lead to Washington becoming the nation’s first president. Thus , Bunker Hill gains even greater historical importance. The Battle of Bunker Hill ( June 17, 1775) , which came two months after Concord and Lexington ( April 19, 1775 “The Shot Heard Round the World” ) , is considered the actual beginning of the Revolutionary War. Concord and Lexington are referred to as ” skirmishes.” British loses were so great at Bunker Hill, despite a technical victory, General Howe concluded that the British had in fact lost the battle for Boston, and was later forced to withdraw to Halifax, Nova Scotia following a winter long siege of the city . I greatly appreciate well researched non-fiction like BUNKER HILL that focuses on specific events and the individuals that played a vital role in the larger story. Another example is David McCullough’s biography John Adams , critical to understanding the American Revolution, the drafting of the Declaration of Independence and the Constitution. An enlightening part of the puzzle pertaining to George Washington and the Revolutionary War is David Clary’s book Washington Lafayette, and the Friendship That Saved the Revolution. The book details the relationship between the childless George Washington and a glory seeking teenage French Aristocrat, Marquis de Lafayette. They become unlikely comrades-in-arms , forming an unbreakable trust with great impact on the war’s outcome and the forming of a new nation. 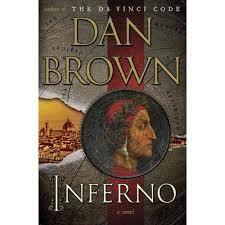 BUNKER HILL, A CITY, A SIEGE, A REVOLUTION is worthy of your time and your library.